A Thyroid Ultrasound is a simple and safe method to examine the Thyroid Gland. 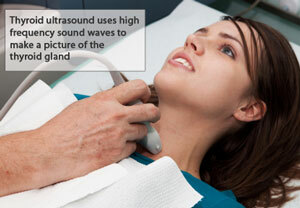 A Thyroid Ultrasound uses sound waves to produce a picture of the Thyroid Gland. The ultrasound machine uses high-frequency sound waves, rather than radiation, taken by a hand-held instrument maneuvered over the skin to develop a picture on a monitor. A Thyroid Ultrasound is used to identify the presence, size, and location of growths within the Thyroid Gland. In addition, it allows for easy visualization of difficult to find growths within the gland, making it possible to access for a needle biopsy or to follow with serial monitoring. Thyroid Ultrasonography is non-invasive, risk-free and painless. A Thyroid Ultrasound provides the best information about the shape and structure of Thyroid Nodules and may be used to distinguish cysts from solid nodules, and to determine if multiple nodules are present. However, it is unable to determine if a growth is cancerous. Dr. Zadeh is committed to providing the highest quality and most efficient care possible so that his patients achieve fast and effective treatment. Therefore, at his office, he has access to the most advanced diagnostic technology available to expedite diagnosis. Dr. Zadeh performs his own thyroid ultrasounds in the office at the time of the consultation. 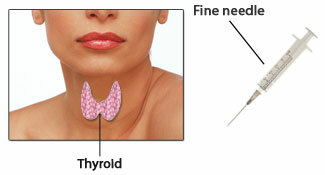 Fine needle aspiration is a biopsy used to determine whether a thyroid growth is cancerous. The biopsy samples the cells in the area of concern which are then sent to a pathologist for analysis. During the procedure, a thin needle is inserted through the skin into the Thyroid Nodule to collect a sample of cells. Multiple samples from a single nodule are usually taken to ensure an accurate analysis. Ultrasound technology can be used to visualize hard to find nodules and guide the placement of the needle. The procedure is carried out in the office by Dr. Zadeh. The samples of cells are then sent to a pathologist for evaluation. This diagnosis is based on the characteristics of individual cells and patterns in clusters of cells that are different from normal thyroid tissue.